Bathroom Designs and Bathroom Remodeling Ideas That Work! 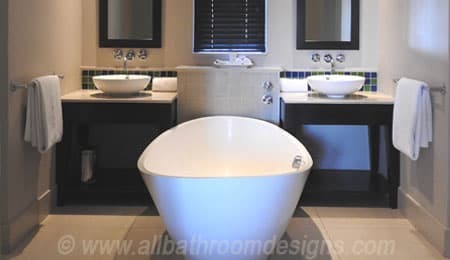 Beautiful bathroom designs can transform your home - whatever your budget! You can create a restful haven for the master bathroom, a fun yet practical kids bathroom or experiment with imaginative ideas for the guest powder room. It does not matter whether you are looking for remodeling ideas or planning a new bathroom - it all starts with the bathroom design. Does the architecture of your house determine to a large extent the style of your bathroom? 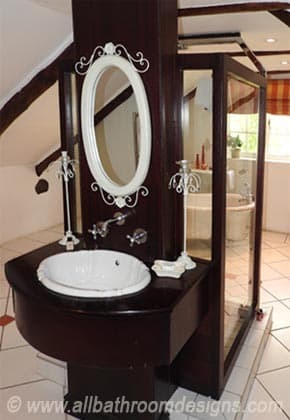 Maybe your house is Victorian and you wish to re-create the antique bathrooms of yesteryear - or you may enjoy an eclectic approach! 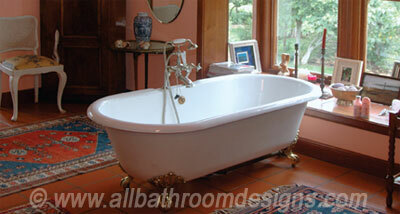 Perhaps you prefer the look of country bathrooms, a rustic bathroom or the uncluttered look of a Japanese bathroom. Raw concrete, stainless steel, corrugated zinc and industrial flooring are amongst the modern materials now welcome in bathrooms. Let us show you how to create that special look. Who said you should not have a red bathroom? 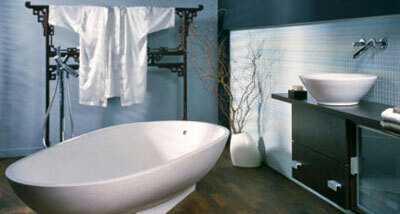 Today's bathroom designs make use of every color imaginable. You can use bathroom colors to enhance certain features, or change the look of a neutral bathroom with the clever use of accent colors. Painting bathrooms have never been easier and is a cost-effective way to breathe new life into tiles, floors, baths or vanities. You may even want to experiment with paint techniques to add pazazz or an element of fun - it's not difficult to do at all! Do you enjoy draped silk, Victorian lace, or the clean lines of blinds? You can use bathroom curtains to add color or texture or to frame a picture window as the focal point. What are the practical considerations and how can you screen your privacy without restricting natural light? Having a lot of space to accommodate everything on your wish list must make for anyone's dream bathroom. His and hers vanities, a generous tub, wet area for a dual shower, private toilet area... Sigh! However, the challenge is still there to create a harmonious design. Having less space does not translate into a bathroom with less impact. Space-saving features such as pocket doors allows for maximum use of floor space and using fixtures that are smaller in dimensions can provide the ideal solution for your room. Decide on your must-have elements and get creative with the layout. Once you've drawn your floor plan and the main elements to scale, it becomes much easier to play around with your bathroom layouts. You may have to look beyond the obvious (such as when there is not enough height along the walls) as illustrated here. You can then make better provision for bathroom storage space, see how to add more natural light if necessary or change the focus of the room. 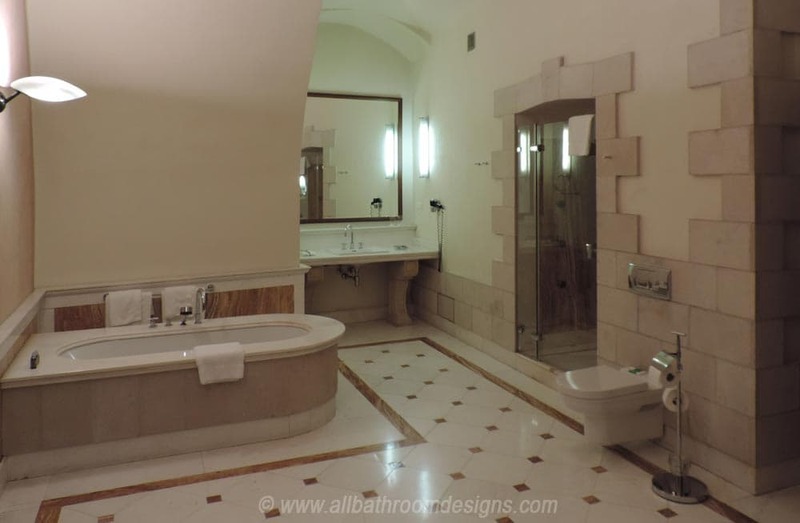 You don't need to be an architect to do your own bathroom designs! And then the fun starts in choosing and using bathroom tiles creatively, finding the perfect faucets, tubs and mirrors and vanities. Not to forget choosing lighting that will be perfect for grooming or setting a mood. 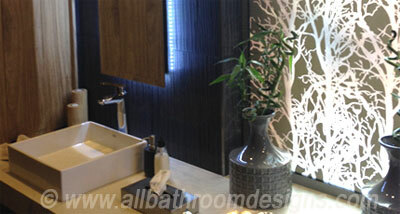 We'll also add practical tips for DIY bathroom remodeling. Be sure to check back here often for updates. What optical illusions do you want to achieve: e.g. make a room look higher, wider, lighter etc. The money spent on a designer bathroom is an investment! Realtors agree that an attractive kitchen and bathroom can turn an otherwise ordinary home into a quick seller. What more reason do you need to transform your room - and have a lot of fun in the process? So, pour yourself a drink, take some time and browse through our bathroom decorating ideas. 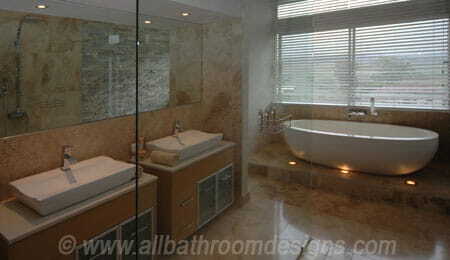 You are sure to find some bathroom designs and practical guidelines that will turn you into a designer. Please Leave us your comment in the box below.